La question de la féminisation du sans-abrisme telle que présentée dans les discours publics depuis plusieurs années doit être interrogée. Pour ce faire, l’analyse mobilise les données de fréquentation de deux opérateurs clés du secteur bruxellois, l’asile de nuit Pierre d'Angle et le Samu social, complétées par les statistiques centralisées par La Strada. Nous verrons que si, en termes d’effectifs absolus, l’hypothèse d’une augmentation peut paraître fondée, c’est nettement moins clair en terme relatif. Si le nombre de femmes sans-abri connaît effectivement une augmentation dans certains services, cette croissance se comprend surtout dans le contexte d’une augmentation générale de la population sans-abri. 2.1. A gender-based residential and institutional background? 1Female homelessness has become an important subject in public discourse, due to an increase in the number of homeless women and a need for specific measures to be implemented in order to stop the phenomenon. This “feminisation” is often presented as one of the recent trends in the evolution of homelessness, along with the issue of young homeless people. Let us point out that ten years ago, a work by the European Federation of National Organisations Working with the Homeless (FEANTSA) presented the phenomenon of “feminisation” as something new [Edgar & Doherty, 2001]. 1 See for example “Mettre les femmes à l’abris”, Le Soir, 10 May 2012. 2As the general press1 presents this discourse based on specific examples, we propose an examination of this assertion in order to obtain a more detailed picture of homelessness from a gender perspective. We shall first use a quantitative approach. The activity reports of two institutions which are active in the area of emergency shelter in Brussels shall constitute our analysis material. These data shall be supplemented by data from a larger number of operators from a coordination centre with an observatory role. 3Afterwards, we shall bring these numerical results into perspective by contextualising the presence of women in the street or in the different housing structures for homeless people. Our data were gathered from individual semi-structured interviews with social workers employed by these institutions, as well as with homeless people. The direct observation method also allows us to support our observations based on field notes written during four years of research [Lelubre, 2009, 2011]. 4In the Brussels territory, the emergency management of homeless people is handled by many stakeholders, some of which have gradually become influential, such as the SAMU social and the non-profit organisation Pierre d'Angle. With no claim to be exhaustive, we have used the data from the activity reports of these two institutions providing emergency shelter to homeless people in Brussels as indicators, because they allow us to go back more than ten years. As we only had access to data which had already been compiled and had undergone statistical processing which varied from one institution to the next, the different units of measurement used (individuals or overnight stays) should be borne in mind when interpreting them. 5La Strada is a coordination and observation body and has recently become the main producer of statistical data on homelessness in Brussels, through specific field surveys and the centralisation of data encoded by some of the many stakeholders in the field. 2 Statement made by the coordinator of a Brussels institution. 6This service is one of the most important institutional resources in the area of shelter for homeless people. The SAMU social has a freephone number available to homeless people or to anyone who wishes to report a person in need, and has various missions whose patrols are undoubtedly the most visible in the Brussels urban space. Each night, the SAMU social provides shelter to more than one hundred people, both men and women. Furthermore, the structure’s philosophy holds that women’s requests for shelter cannot be refused. “This public is deemed to be more vulnerable in the street and must therefore not be turned away for lack of room.”2 We shall examine this principle of “vulnerability” attributed to the female population and its effects on female homelessness. 3 Brussels Samu social 2010 activity report, p. 87. 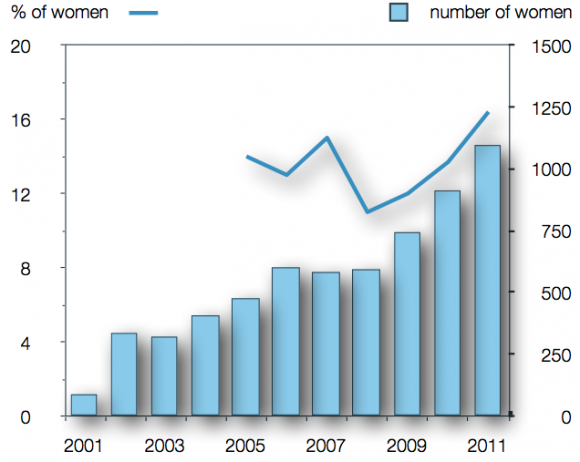 7The number of women included in the service’s census increased significantly and almost tripled between 2002 and 2011, rising from 337 to 1092 (figure 1). Women with children represented approximately 9% of the accommodated population in 2010, but are not referred to explicitly in the discourse on the “feminisation” of homelessness, in particular because these families receive specific support. Faced with these data, it is clear that the institution observes “a steadily increasing number of isolated women and families”.3 However, let us point out that the increase in absolute numbers is not conveyed by a radical modification in the ratio of men to women among the isolated people who receive help. When we analyse the percentage of isolated women in the homeless population which was the object of a census carried out by the SAMU social, we may conclude that there is indeed a noticeable increase in the relative proportion of women in recent years, but that this proportion is only slightly higher than it was between 2005 and 2007. While the increasing trend in the actual number appears to be irreversible, this assertion is less clear in terms of relative proportion, and must still be confirmed. SAMU social 2001 to 2011 activity report. Pierre d'Angle 2010 activity report. 8The non-profit organisation Pierre d'Angle – founded in 1988 – is another operator which has been around for quite some time in Brussels, providing 48 beds all year long. Since 2000, the association has opened both of its dormitories for the entire year, whereas in the past, one of the dormitories was only open during the winter months. This change in capacity must be considered in the analysis. Let us mention that this institution does not provide shelter for families. 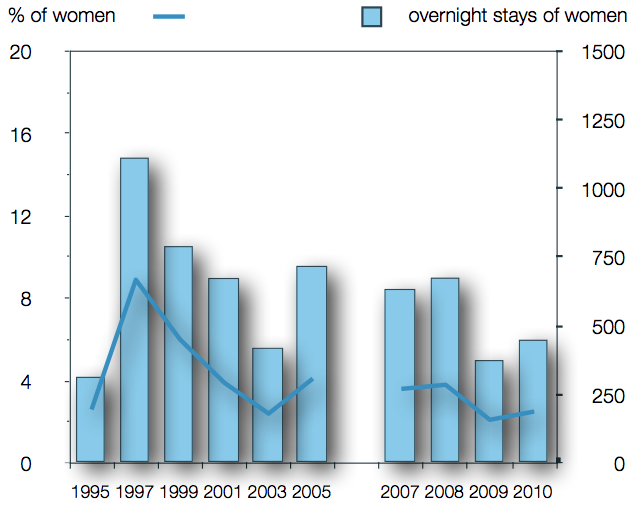 9The data gathered between 1995 and 2010 regarding shelter for isolated women – expressed here in terms of overnight stays4 – do not point to a clear trend. In absolute numbers, the upward trend observed by the SAMU social was not observed by Pierre d'Angle. When the relative proportion of women within the population of those who receive shelter is taken into account, it remains extremely marginal throughout the period considered, but is also relatively stable and has even undergone a slight decrease. 10La Strada is a new operator in Brussels, and is a centre providing support to the sector of aid for homeless people in Brussels, created by the Joint Community Commission in view of harmonising the aid provided to homeless people in the capital. La Strada has several missions, including that of observatory. In 2012, La Strada published a collection of data on homeless people’s stays which allows a better understanding of the characteristics of the homeless population. 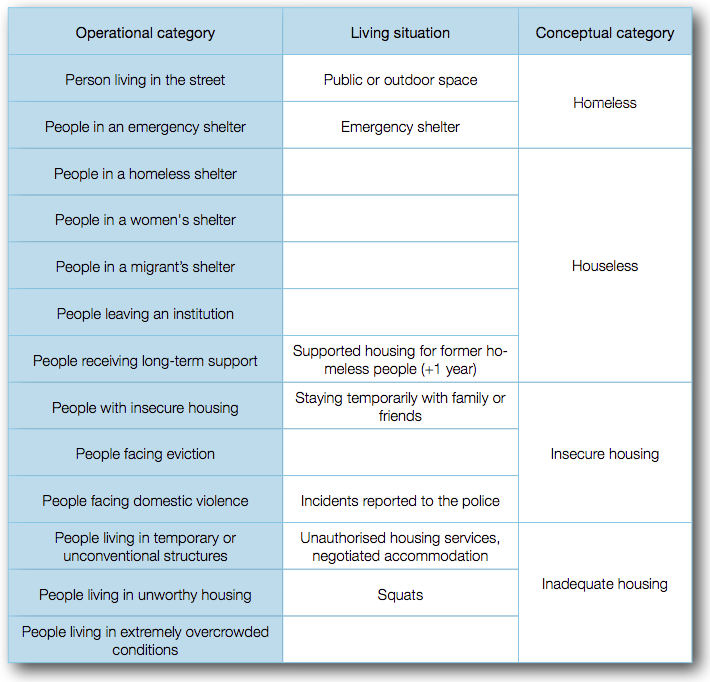 But inasmuch as emergency shelter is under-represented in the sample of centres which participated in the gathering of centralised data – in particular due to technical reasons related to anonymity5 – this source has not been used here to measure homelessness in the strict sense. The census carried out on 8 November 2010 – which was also coordinated by La Strada – was used in addition to the similar census carried out in 2008. It was aimed at covering all of the places which provide shelter to homeless people with either no housing or inadequate housing, from initiatives in the street to supported housing. Census of homeless people in Brussels – La Strada. 12The data presented above provide us with an initial picture of the situation of homeless women, with no guarantee of representativeness or exhaustiveness. 13The figures from the census carried out by La Strada are more representative as they include the public space, and indicate that in 2010, women represented 24% of the population considered homeless in the strict sense (in the street or in a centre for emergency shelter) and 27% in 2008. However, the length of the period covered does not allow a true understanding of the evolution over time. 14The data from the two providers of emergency shelter show that although the number of homeless women who have received help over the past decade has increased at the SAMU social, this increase has not been confirmed at Pierre d'Angle. Let us mention that the data from the latter institution were expressed in terms of the number of overnight stays, whereas the data from the SAMU social were expressed in terms of individuals; the comparisons are therefore limited, as it is not really possible to make a long-term comparison of the length of a critical situation. Furthermore, let us mention that these two sources do not provide direct indications about the homeless population but instead about the number of homeless people who make use of emergency shelter structures. The gradual arrival of these social aid structures among homeless people indeed must have resulted in an increase in their use. 15Relatively speaking, based on the data from these two emergency shelter stakeholders, it is not possible to detect a clear trend involving an increase in the number of homeless women. The increase in the absolute number of homeless women is therefore part of a growing phenomenon of homelessness in general, and not of the “feminisation” of homelessness. It is therefore necessary to try to understand how the question of the “feminisation” of homelessness partly masks the issue of an increase in homelessness in general. As women are at an increasing risk of destitution [Cherenti, 2010], the proportion of women within the homeless population should experience a similar trend in relative terms as well. The data presented seem to confirm this relative increase. We must therefore try to understand the low number of women within the homeless population and the reasons for the rallying of the public against the “feminisation” of homelessness. 16According to the data collected by La Strada in 2010, 88% of women with housing problems received accommodation in housing structures, 66% of whom were received in shelters, whereas 70% of their male counterparts benefited from accommodation, 57% of whom were received in shelters. This leads to the hypothesis that the low number of women in the street is due to the organisation of the institutional network, which favours the accommodation of women in housing structures, mainly in shelters for long-term periods. Furthermore, a difference in behaviour between men and women with respect to a lack of housing may also be underlined: women turn to their informal network more readily. Finally, as the evaluations were based essentially on a visual census in the field or on the functioning of shelter structures, it is also possible that women develop invisibility strategies whereby they make use of emergency shelter structures only as a last resort, thus making it more difficult to identify them. 2010 report on the number of homeless people in Brussels – La Strada. 17In the history of the housing structure sector, centres intended for women emerged at the end of the 19th century, for both unmarried mothers and young female workers who were forced to live far from home. This predominance of long-term structures for the female population still exists today [De Backer, 2008]. 18Since the number of places changes according to the demand, it is not always easy to obtain a precise mapping of the housing sector. According to the data published by La Strada in the framework of the centralisation of data, in 2010 there were 372 places available for isolated men, 370 for women (with or without children) and 376 for anyone (men or women, with or without children). Among the latter, 215 were provided in the framework of emergency shelter centres. 19These figures might imply that there is relative equity between men and women, and that the situation is even slightly more advantageous for the male population, as a large number of the places reserved for women are taken by their children. However, the size of the initial demand also has an impact on how the available offer is viewed. While it may be considered equal, the same is not true of the demand, as men in search of emergency shelter must face greater competition. The census carried out by La Strada mentioned in the quantitative part is a good indicator of the use of different housing resources by women, whereby shelter is the first form of aid provided to women with housing difficulties, with their presence in the street thus less common. 20Institutional organisation therefore works towards helping women get out of a situation of homelessness, providing accommodation to them in institutions with a long-term perspective, thus making them houseless and no longer homeless, as we shall explain in the section regarding the categorisation of the phenomenon. 21Along with these institutional reasons, it is also necessary to consider women’s reasons for possibly refusing to make use of emergency shelter structures. Homeless people are rational stakeholders who make choices which influence their acts, and not only recipients of social aid [Thelen, 2006]. In the Walloon Region, our study concerning emergency shelter centres [Lelubre, 2009] led us to conclude that the feeling of insecurity was not an obstacle to using these centres. However, they were organised differently from their Brussels counterparts. With a capacity rarely exceeding fifteen people7 in several rooms, episodes of violence may occur but are infrequent. The Charleroi network provides accommodation to women in special conditions, with a night shelter for couples, families and isolated women, and a second shelter with a separate room for women on a different floor. Given the size of the night shelters in Brussels and their configuration – such as a mixed dormitory8 – we may put forth the hypothesis that the feeling of insecurity, as mentioned by many authors with respect to French institutions [Damon, 2002], is more pronounced in the Brussels territory and affects women in particular. 22Despite the prevalent tendency to point them in the direction of women’s shelters in addition to their individual strategies, some women nevertheless receive shelter in emergency structures. Our hypothesis is that such cases are due to a more disassociated profile, presenting an accumulation of problems (addiction, mental health, debts, etc.). 23While these problems are partly to blame for the fact that these women end up in the street – thus neutralising the types of protection made available upstream – they are also the reason why these women cannot be directed towards other institutional resources. Shelters are faced with increasingly strict legal requirements, financial difficulties (preventing them from hiring more staff), a rising demand (with a rising homeless population), as well as a need for long-term management, and many of them have gradually hardened their conditions for access, accepting only a very small number of the worst cases. 24These homeless women end up in a vicious circle against their will, with their most serious pathologies plunging them into a spiral of emergency need with no escape. Although women are less at risk of becoming homeless, once they are, they have more difficulty getting out of their situation due to their more disassociated profiles. And it seems that in this respect, our society is able to ensure equality of the sexes, as homeless men suffering from these types of serious pathology are confronted with the same phenomenon of status quo in terms of emergency need. 25In addition to the different use of institutional resources, the studies show that women who encounter housing difficulties are more likely to stay with a third party, such as extended family members or friends [Marpsat, 1999]. 26During interviews conducted with homeless men, we observed that many of them had refused to ask to stay with a third party due to a feeling of shame for not being able to support themselves. On the contrary, we observed a less frequent occurrence of this feeling during the interviews conducted with homeless women, as it was natural for them to stay with family due to the fact that they had children. Furthermore, these mothers are more reluctant to turn to the social aid network due to a fear that drawing attention to their situation would lead to their children being placed in foster homes. Staying with people in their informal network creates a phenomenon of invisibility, which accounts for the smaller number of women in the statistics related to the homeless population. La Strada’s figures show that before arriving in a housing service, the proportion of women and men who come from an emergency shelter is identical (23.5%). However, 33.8% of women come from a private home (11.2% of men) and 24.6% from a family member’s home (15.8% of men). It seems important to us, however, to put the long-term role of the informal network into perspective. During our interviews with people who received accommodation in a shelter or who were registered in a supported housing programme, we observed that although most of them had stayed with a family member or friend at some point, this cohabitation had usually ended suddenly after a few months, forcing these people to enter into contact with the social aid network. 27Finally, while living in the street is a challenge for anyone (Thelen  compares the street to a totalitarian institution), being a woman is an additional obstacle for a homeless person to have to face, in particular in order to avoid being a victim of sexual assault. 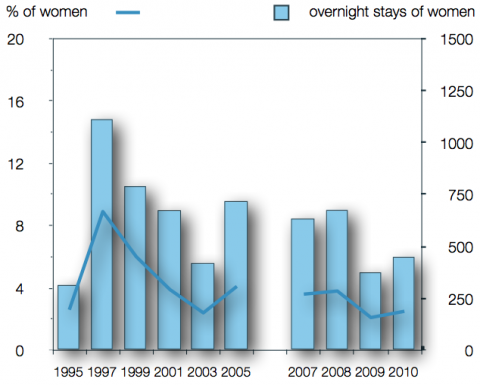 The strategies used by homeless women may be of two – often complementary – types. A first strategy is to find a male friend who can play the role of protector, at least temporarily, with the latter possibly committing acts of sexual aggression himself. Another strategy used by homeless women is to mask their femininity in order not to be potential victims [Vaneuville, 2005]. Loose clothing, hair hidden under hats and a masculine gait thus become the new tricks used by these women. Physical appearance is not the only thing which suffers due to this attitude. As it provides them with security not to draw attention to themselves, the invisibility sought by homeless women may result in less frequent use of social services and therefore lower numbers in the related statistics. Once again, this desire to remain invisible with respect to the available services only lasts a short time while they are new in the street, as sooner or later they turn to institutional resources in order to satisfy their basic needs. 28The quantitative analysis questioned the “feminisation” of homelessness in terms of a growing proportion of women in the homeless population, while confirming their significance in terms of absolute numbers. We therefore wish to question the emergence and persistence of the notion of “feminisation” in the discourse of stakeholders from the sector, when in fact, the sector is faced with an overall growth in numbers of men and women alike. The first explanation is that there is some confusion regarding the use of the term “feminisation”, which should refer to an analysis in relative – and not absolute – terms. It is understandable to favour an interpretation in absolute terms, and even to use an ambiguous term, since the daily problems in the field are expressed in the number of places and not in relative proportions. But an inadequate categorisation of the phenomenon of homelessness as well as the image of women held by stakeholders in the field may also create confusion. 29There is still some hesitation regarding an adequate term to use for qualifying the phenomenon of people with housing problems [Pichon, 2009]. An overly general categorisation of the homeless population leads to a muddled understanding of the phenomenon, especially when the aspect of gender is added. Since the beginning of the 1990s, there has been an increasing use of the term “SDF” in French (“sans domicile fixe”, or “person without fixed abode”), while the term “homeless” continues to be used, leading to a gradual assimilation of the two terms. From an academic point of view, this equivalence must be questioned. 30In this article, all of the quantitative data used concerns two specific situations, i.e. living in the street or receiving shelter from an emergency structure. Our choice was in line with international recommendations regarding the definition of situations of housing exclusion. 31The ETHOS10 typology elaborated by FEANTSA has its shortcomings, in particular due to its objective to be applicable in all European countries, which makes certain categories less pertinent than others for certain countries. It nevertheless has the advantage of shedding light on situations related to homelessness. It has four categories covering 13 different residential situations. Two of them are covered by the term “homeless”: sleeping in the street or in an emergency shelter structure. Houseless people, on the other hand, are partly covered by the term “SDF”. This acronym is used for people who have access to a place of residence even if it is variable. In particular, this includes the situations of people who receive medium- or long-term accommodation from a housing institution. People who stay with family or friends or who live in a squat are considered to have insecure housing. As regards people who live in a squat, the analysis of data from Charleroi shows that this group of people may also be considered as “homeless”, because they alternate between staying in emergency shelter structures and squats, in particular during the harsh winter months [Bouillon, 2005]. 32The reality of homeless people is far from being monolithic. Having to spend their nights outside or in an emergency structure which they must leave early in the morning, or being able to stay for several months in a shelter, are without question different statuses. Our analysis of women's answers regarding social emergencies showed differences with respect to those of their male counterparts. It is necessary to consider this difference when one speaks of a “feminisation” of homelessness. 33As shown by the data gathered by La Strada, and as we have analysed within the framework of a gender-based residential background, homeless women benefit from specific support involving housing structures, with two thirds of women living in a shelter. Therefore, in accordance with the categorisation explained above, the two thirds of women with housing problems must not be considered as homeless, but rather as houseless. Unsuitable or unclear categorisation may therefore create an overlapping of different situations. 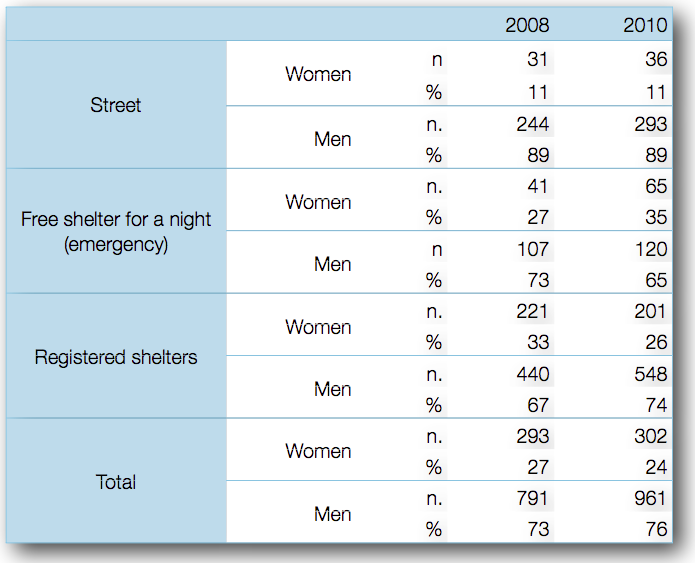 2010 report on the census of the homeless population in Brussels – La Strada. 34Furthermore, the omnipresence of this theme in public discourse is also due to social representations which associate women with notions of physical and emotional weakness, resulting in a difference in the type of social protection offered. In a context of insecure financing for the sector, this social representation may be used in order to attract the attention of public opinion and providers of funds. 35Beyond the discourse, our observations in the field11 have indicated that the aspect of gender may have an impact on how a situation is dealt with. The necessity to protect these women from harsh weather as well as from possible violence committed by their peers, are two major concerns for the social workers interviewed. 36The image of the female vagabond, exposed to dangers in the street as well as assaults – in particular sexual assault – experienced by most women who have lived in the street [Vaneuville, 2005], influences practices in the field. It is not easy for collective conscience or for social workers in contact with these women to abandon them when they are faced with these dangers. We see two consequences of this specific image of women. Firstly, the intolerable nature of their situation makes them all the more visible, accentuating the idea of a quantitative increase. Secondly, the psychological effort needed to accept the presence of women in the street leads to the emergence of public discourse aimed at drawing the attention of the authorities to this question – an attitude which is justified by the idea that a woman's place is not in the public space [Boinot, 2008]. 37Today in Brussels, there are probably more women living in the street than there were ten years ago. There are undoubtedly many more of them in certain shelters for homeless people, in keeping with the trend seen among their male counterparts. While the increase is clearer in absolute numbers than in relative proportions, the “feminisation” of homelessness is a reality which needs to be clarified. 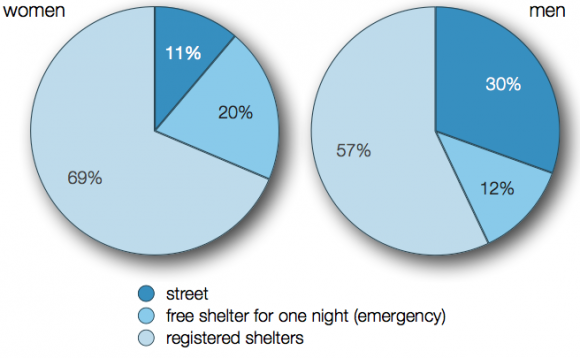 The available statistical data gathered from different services show that the presence of women in the street and in emergency shelter structures – two residential statuses corresponding to the concept of homeless person as defined in the international texts – remains low. On the other hand, when there is an increase in the number of women as in the case of the SAMU social, it must be considered in the wider context of an increase in the phenomenon in general. As mentioned above, the data used concern people who use aid services and do not cover part of the phenomenon – a fact which we cannot ignore. 38According to Vranken et al. [2001: 118] “neither quantitative studies nor data concerning the increase in social services for women corroborate the hypothesis of a possible "feminisation" of poverty. They suggest that this new debate is based on a series of publications and on the media coverage they receive, rather than on a true reflection of the situation”. Without going as far in our assertions, we have attempted to specify exactly what is included in the discourse on the “feminisation” of homelessness. 39While poverty affects women and men equally, we have attempted to understand – in a context of an increase in homelessness – the relative stability of the ratio of men to women in the street and in emergency shelter structures via several concomitant phenomena, namely a gender-based residential background and the individual strategies used by women with housing problems. This may be explained by the more general tendency to use an informal network, a search for invisibility and the organisation of social action whereby women are directed towards long-term housing structures. 40The reasons why the issue of homeless women has monopolised public discourse nevertheless still need to be explained. Beyond the confusion between an absolute or relative increase in the phenomenon – according to the practices and needs of stakeholders in the field – the first reason is an inadequate categorisation of the phenomenon. While the ETHOS typology – adopted during the European Consensus Conference on Homelessness in December 2010 – defines homelessness as sleeping in the street or in emergency shelter structures, the discourse sometimes tends to lump together all types of housing difficulty. Finally, we have also put forth the hypothesis that the image of women may have an impact on how the phenomenon is considered: abandoning women in the public space at night has such a psychological impact on the collective conscience that it leaves a lasting mark on operators and the general public in terms of how they view the phenomenon. BERNARD, Nicolas, 2007. Femmes, précarité et mal logement : un lien fatal à dénouer. In: Courrier hebdomadaire du CRISP. Vol. 3, No. 1970, pp. 5‑36. Boinot, Karine, 2008. ‘Femmes sans abri’. Précarité asexuée ?. In: Vie sociale et traitements. No. 97, pp. 100‑105. BROUSSE, Cécile, 2006. Le réseau d’aide aux sans-domicile : un univers segmenté. In: Economie et statistique, No. 391‑392, pp. 15‑34. DE BACKER, Bernard, 2008. Les cent portes de l’accueil. Brussels: Couleur livres. EDGAR, Bill & DOHERTY, Joe, 2001. La femme sans-abri en Europe. Parcours, Services et Expériences. Brussels: FEANTSA. ITALIANO, Patrick, 2007. Du ‘capital social’ à l’utilité sociale. Liège: Université de Liège. LELUBRE, Marjorie, 2009. Freins et facilitateurs à l’accueil, l’hébergement et le logement des personnes sans-abri. Charleroi: Relais social de Charleroi. MARPSAT, Maryse, 1999. Un avantage sous contrainte : le risque moindre pour les femmes de se trouver sans abri. In: Population, 54th year, No. 6, pp. 885‑932. PINCHON, Pascale (Dir. ), FRANCQ, Bernard, FIRDION, Jean-Marie, MARPSAT, Maryse, ROY, Shirley & SOULET, Marc-Henry, 2008. SDF, Sans-abri, Itinérant, oser la comparaison. Louvain-la-Neuve: Presses universitaires de Louvain. RACINE, Guylaine, 1993. L’intervention en santé mentale : le mandat inattendu des maisons d’hébergement pour femmes sans abri. In: Santé mentale au Québec. Vol. 18, No. 1, pp. 251‑268. REA, Andrea, GIANNONI, David, MONDELAERS, Nicole & SCHMITZ Patricia, 2001. La problématique des personnes sans abri en Région de Bruxelles-Capitale. Brussels. Institut de Sociologie: Université Libre de Bruxelles. THELEN, Lionel, 2006. L’exil de soi : sans-abri d’ici et d’ailleurs. Brussels: Facultés Universitaires Saint-Louis. 4 By reason of unconditional shelter, the institution does not list people’s names, which makes it impossible to establish statistics related to the number of people. 5 See pages 13 to 15 of the report published by La Strada (2012), Recueil central des données des maisons d’accueil et des centres d’hebergement d’urgence en Région de Bruxelles-Capitale. Données des séjours des personnes sans abri accueillies en 2010. 6 Data from the report published by La Strada (2011), Deuxième dénombrement des personnes sans-abri, sans logement et en logement inadéquat en Région de Bruxelles-Capitale, le 08 novembre 2010. 7 This configuration prevailed when we conducted this study in 2008-2009. Since then, there has been some institutional reshuffling, leading to the merging of two structures, thus increasing their capacity to 33 places. 11 Carried out during two three-month periods, in night shelters, day shelters and with a street unit, as well as in shelters in the Charleroi region. Marjorie Lelubre is a research fellow at the Charleroi Relais Social and is writing a thesis in sociology at Facultés universitaires Saint-Louis in Brussels. In 2012, she and C. Buxant coordinated the proceedings of the 10th anniversary conference of the Charleroi Relais Social, entitled “Sortir du sans-abrisme…? Interrogeons 4 mythes de l’Action sociale”.